Bible References: Mark 15:33-37 and John 19:28-30. Jesus was crucified at about 9:00 a.m. on Friday morning. At 12 noon, darkness came over the land and remained until about 3:00 p.m. By 3:00 p.m. Jesus was in extreme agony, both physically and mentally. His physical agony was from the effects of the Roman soldiers’ torture, the crown of thorns, and the nails that pierced his hands and feet so that he would hang on the cross. Christ’s mental anguish came from two sources. First, Jesus, who never sinned, had the weight of the world’s sin on his mind; he felt all of mankind’s perversions and violence. Second, the perfect, righteous God could not look at Jesus while Jesus was saturated with the sins of mankind. During the 6 hours Jesus was on the cross, God turned his face away from Jesus. Jesus was horribly alone for the first time in his life in heaven and in his 33 years on earth. It is no wonder Jesus cried out, “My God, my God, why have you forsaken me?”(Mark 15:33). Hearing Jesus’ words, some individuals standing near the cross concluded that Jesus called for Elijah. One man ran and filled a sponge with wine vinegar, put the sponge on the stalk of a hyssop plant, and lifted it to Jesus’ lips. Jesus drank the wine vinegar. Because the man had the authority to give Jesus wine, he was a Roman soldier or official. Not uncommonly, Roman soldiers gave water or wine to men being crucified in order to revive them and to prolong the dying process. Attempting to revive Jesus was the man’s motivation for giving Jesus wine vinegar, because he said, “Now, leave him alone. Let’s see if Elijah comes to take him down” (Mark 15:36). Neither God nor Elijah came to rescue Jesus. Instead, soon thereafter Jesus gave his last breath and died. Controversy surrounds the type of the hyssop stalk, or reed, used to offer Jesus wine vinegar while he was on the cross. Very likely this hyssop reed, wasn’t the hyssop of the Old Testament (see the story of David killing Uriah in Chapter 6). This hyssop doesn’t have a long (perhaps up to 6 feet) sturdy stalk that could have reached Jesus’ lips when he was on the cross. Several writers proposed that the hyssop reed was from the genus Sorghum. The primary sorghum in Israel is Sorghum halepense. 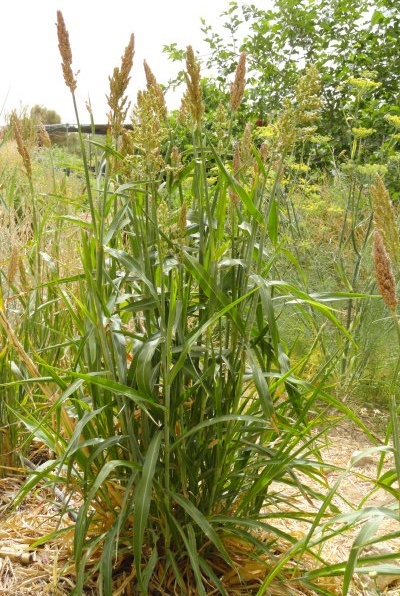 In Israel, another name for S. halepense is Aleppo Millet Grass while in the United States it is called Johnson grass. Sorghum is suited to the climate and agricultural conditions of Israel. It can thrive in the lowlands and mountains as a non-irrigated summer crop. We saw healthy sorghum growing in the southern Negev Desert in Kibbutz Lotan; however, crops were irrigated on the kibbutz with non-potable water. Often sorghum grows wild in disturbed areas such as ditch banks, and along roadsides. It is partial to heavy soils. In this passage, the hyssop reed symbolized the end point or finish. After Jesus received the wine vinegar on the hyssop reed, his final words were, “It is finished” (John 19:30). He finished all the tasks set before him to include enduring the cross. Genesis records another example of finished work; by the 7th day, God finished the work of creating the earth so he rested (Genesis 2:2). For mankind Christ’s finished work on the cross, symbolized by a final sip of water from a reed, was as important an ending as creation of the world. This entry was posted in Plants in Holy Week and tagged Bible Garden, Bible Plants, Bible Study, Christ, crucifixion, God as a Gardener, hyssop reed, Jews, Sorghum halepense, thirst. Bookmark the permalink. Another look at Hyssop. As always well done and very informative.